Ruptured ovarian cyst is a condition that must never be neglected. Quick action must be taken even if there is no rupture yet, but the test results indicate that the cyst can rupture. Do remember that a cyst that ruptures not only causes severe pain, but can also lead to serious medical complications. Do also keep in mind that a cyst that has broken up may demonstrate symptoms that are quite similar to one that is intact, and this can be confusing for the woman and also the doctor. But more often than not, severe abdominal pain that is mostly felt in the lower abdomen is the hallmark of a ruptured ovarian cyst. This pain is felt not only during menstruation but also immediately prior to it or following it. Even though gynecological diagnosis is essential when a patient arrives at the emergency department of a hospital with complaints, the attending medical team primarily engages themselves in stabilizing the patient's condition. It is only thereafter that routine tests are done for ascertaining the cause and effect of the rupture. The pathologist does a blood test to figure out the patient's actual condition by checking the hematocrit level, which will tell about the hemoglobin percentage in the blood. If this is found to be lower than average, it may indicate the patient has suffered severe blood loss due to the cyst rupture and has turned anemic. Arrangements for blood transfusion may become necessary at this stage. Along with this, a urine test is also conducted to see if any pus or blood coming out of the ruptured cyst is likely to create any infection or septic condition. And then a pregnancy test is done to confirm that there is no complication in regard to ectopic or fallopian pregnancy, which is rather common with ovarian cyst rupture. Corpus Luteum Cyst rupture among pregnant women can cause problems. In some cases there can be no symptoms, and in others there can be really acute pain. Of course, abnormality or sequelae (a pathological term meaning 'as a sequence to earlier complications') varies from one person to another. In severe cases of ruptured corpus lueum, intraperitoneal hemorrhage may occur, leading to death of the patient as well. However, continuous medical care that includes laparoscopic surgery or laparotomy is required for achieving homeostasis and saving the life of the patient. CT scanning is recommended to accurately diagnose a ruptured Corpus Luteum cyst. The scan result shows the cyst with thick enhancing rim, and also the presence of highly attenuated peritoneal fluid. Chocolate cysts that in reality are endometrial cysts can rupture too. Endometrial or chocolate ovarian cysts form when a small part of the lining of the womb, which is medically termed endometrial bleeds, gets detached, become transplanted and begins to grow in size within the ovaries. When the cyst eventually ruptures or bursts, the chocolate colored contents spill over into the pelvic region, overflowing onto the surface of the uterus, bowel, bladder and the relative space between these vital organs. As a result, adhesions develop, and this causes numerous gynecological complications including pain, fever and nausea. Treatment for symptomatic endometriosis may begin with NSAIDS (non-steroidal anti-inflammatory drugs) to provide relief to the pelvic tenderness that is followed by oral contraceptives to achieve an anovulatory (non-ovulating) state. If the patient fails to respond to these non-invasive approaches, either Laparoscopic surgical approaches or conservative surgery are applied to preserve the fertility of the woman. Inability to identify the cyst early on is the main reason why the situation may become dangerous. Infection and hemorrhage caused from the rupture can become life-threatening later on, and thus the condition must be detected early and the right treatment should be started. Prevention is always better than cure. So you should take timely action instead of trying to rectify the situation when the cyst bursts or when there is a possibility of it bursting. Most treatments make the mistake of treating the symptoms and not the root causes. And this is why, the cyst often returns. Yes, even if the cyst has already burst and caused a lot of pain, you can have it again. Turn to holistic remedies and treat the root causes and you will not have the cysts any more. Discover The Only Clinically Proven & Unique 3-Step Ovarian Cysts Healing System. 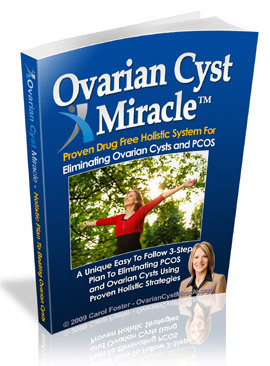 Permanently Eliminate All Types of Ovarian Cysts Within Two Months. Click Here!